IndiaSoft is India’s exclusive international IT event comprising of exhibition & conference. IndiaSoft 2018 brings to you IT business opportunities including Banking, Finance, Telecommunications, Insurance, Bio Informatics, Media & Entertainment, Travel, Hospitality, Hotel, Transportation, Logistics, Pharma, Educational, E Governance, and much more that too under one roof. We are in the IT industry from 18 years and we love to meet and connect new clients, talk about their challenging ideas, provide appropriate solution and consultation to them, and more tech talks. You may also like: How To Choose Media Cost Models For Paid Campaigns? 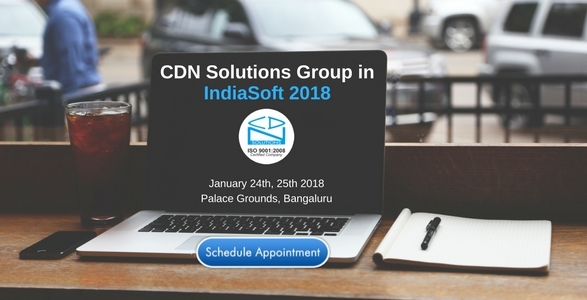 Now this year, we are again ready to exhibit in Indiasoft 2018 to showcase some of our tremendous Industrial IT solutions developed in latest technologies such as Internet of Things, Cloud Computing, Augmented Reality (AR), Virtual Reality (VR), Beacon, Wearable, Blockchain, Artificial Intelligence, and more. So get ready to discuss your idea at the show by scheduling a meeting here, or you can also share your requirement right away here.